Maybe It’s Time To Serve Someone. I remember back in the early 1980’s, there was a boy known as “The bubble boy” who had to permanently live in a plastic bubble. He had a compromised immune system, and any exposure to the outside world could cause him to get sick and die. As I prayed this morning, the Lord brought that analogy to my mind as I thought about missions and service. You see, many of us are living our lives trying to avoid the world. While the boy in the bubble was safe from the world around him, he was relegated to a life of ineffectiveness. We spend an awful lot of time on the second part while often ignoring the first part. I think we are often afraid of what will happen if we take the world on for God’s Kingdom. But there is no reason for fear. Hebrews 13 20-21 says, “Now may the God of peace, who through the blood of the eternal covenant brought back from the dead our Lord Jesus, that great Shepherd of the sheep, equip you with everything good for doing his will, and may he work in us what is pleasing to him, through Jesus Christ.” That’s right, we have access to the same power that raised Jesus from the dead and we walk in that victory as more than conquerors. Jesus showed us the example we should live by in that he was the perfect imitator of The Father. How did he show that? By being a servant. Are you feeling ineffective? Serve someone. Feeling beaten down? Serve someone. Are you feeling like you don’t know your place in the church? Serve someone. Do you feel called to missions but don’t know how? Serve someone. Feel like you are still working on you? Serve someone. The more we take the focus off of ourselves and place it on God, the more he can do with us. And God will take faithfulness with little and give you larger things to be faithful with. I’ve been back from Ethiopia now for nearly a month. I’ve thought about a lot of things in that time, from the things I’ve seen and the people I’ve met, to the vision I have for what God is doing. It’s very exciting, but also upon returning, I can’t help but feel as if I’ve come back to an American church that is fast asleep. The bible says that “my people perish for lack of knowledge.” Well, without knowledge, you can’t move on to wisdom. And without wisdom, there is no vision. Without vision, we have no purpose. Without purpose, we start chasing all kinds of crazy things, and the church gives up the gospel in exchange for prostituting itself to the world in the hope of finding “cultural relevance.” The bride of Christ is searching the street corners, looking for someone to tell her she’s beautiful. I often teach a class on missions and poverty alleviation, and one of the questions we open with is, “Why did Jesus come to Earth?” The two most common answers I get are, “So my sins could be forgiven,” and “so I can go to Heaven.” Though both answers are technically correct, they are both tertiary reasons and completely egocentric. Jesus came to restore what was lost, and to put us back into relationship with God. He set in motion a restoration of relationship between God and creation. It wasn’t just so we could be saved from Hell but continue to do what we were already doing. It states right in the beginning of Genesis that men and women were created in God’s image. That being the case, we ought to imitate Christ as he imitates God the Father. If we accept Jesus’ sacrifice without accepting this second part, we have reduced ourselves to God’s immortal pet, his hamster, if you will, existing for God’s amusement but with no purpose, born only to consume. I believe that this is why the American church is largely devoid of men. Men are designed and built to serve a larger purpose, to take hold of a challenge and to serve a greater purpose than themselves. But if we accept a Christianity that says “I’m saved now. Just sit in the pew on Sunday and listen to a watered down message of meek and mild Jesus,” a great injustice has been done. Do we need to be reminded that Jesus drove the money changers out of the temple with a whip….twice? Jesus gave us a lot of instructions, most of which we aren’t following. Sure, we follow the ones about keeping ourselves pure…..sometimes, but what about all those ones about going out like sheep among wolves? What about all those instructions about feeding the poor, standing up for the widow, the orphan, and the alien? What about blessing those who curse us, or showing love to our enemies, or were those instructions for somebody else? What about dying to self? God is looking for men and women of purpose. The Church has got to wake up. I’ve now been back from Ethiopia for a week. I rolled into town on Saturday night, and had to be at a conference on world missions literally the next morning. That conference ended this morning and now I have a moment to stop and gather my thoughts. I saw a number of encouraging and discouraging things on this last trip to Ethiopia, but fortunately it was mostly the former. Back in 2012 I began to pray that I would see God move, and that prayer has not just been answered, but continues to be answered in ways more profound than I knew I was asking. My first trip to the Borana region along the borderlands of Ethiopia and Kenya was no exception. It was like no place I’ve been before. I wondered in a previous blog if it would be similar to South Sudan, due to its proximity, and the answer is that it wasn’t similar to South Sudan in either landscape or culture. I’ve been to eastern Ethiopia a few times now, and whereas that region is dominated mostly by Islam, the southern region is mostly animist or traditional religion. Books and movies tend to have a somewhat romantic vision of animism, but when you actually go and talk to the people living it, you find out just how oppressive it is. I will probably get into the details of that in a later blog, but for now I’d just like to tell a short story about a woman (a girl really) that I interviewed last week, and how it relates to the western church. My main function in going to the places I do is to tell the story to others when I get back, through photography, video, and writing. Consequently I always have my ears and eyes open for compelling stories when I’m out in the field. As I listen to reports of the indigenous church planters, patterns develop. One of those patterns is one of persecution. It’s almost universal, which is something the western church has a hard time understanding. This again is something for a future blog, and why persecution is not only to be expected, but in some ways is necessary to complete our calling. So when I hear a story that goes completely against the grain of what’s normal, I take notice. I met a woman who was 24 years old, though honestly she didn’t look over 18. She was both quiet and unassuming, yet at the same time fierce. She had gone out to a village where the gospel of Jesus had not been heard yet, and in six months sixty people had committed their lives to Christ, and 51 had already been baptized. She was not being persecuted, and in fact more people were hungry to hear what she had to say. When I bring this report home, the church is of course elated. It is, after all, good news. But then I started to think about it, and the broader issues of what this means. You see, Jesus told us to go, figuratively speaking, to Jerusalem, and Judea and Samaria, and to the uttermost parts of the earth, teaching all he commanded and making disciples. When we hear stories over and over again of persecution and people falling away because they are physically attacked, or rejected by their families, or they’re fired from their jobs, it’s easy for us to tell ourselves this is why we haven’t fulfilled this command. But when I meet a woman that goes to a new village and has huge success with no persecution, the truth comes out; the truth that there was a village out there that was hungry for the gospel, the the only reason they didn’t receive it was because in 2000 years since the instructions had been given, no one had bothered to go. The good news is that it’s never to late to change our priorities, but how many have been lost in the interim? While we send 40% of our short term missionaries to Mexico, a nation with a sizable church presence capable of doing their own work, we virtually ignore the thousands of people groups that have never once heard the gospel. Oswald Smith said, “No one has the right to hear the gospel twice when there are those who haven’t heard it once.” I agree with him. We go repeatedly to the places that are easy and saturated, while ignoring the places that are hard. But awareness and faithfulness are everything. Now that we are aware, let us be faithful to do the job that we have been given. I’m not putting up a picture of the girl I spoke of, but I am posting a few other pictures from the southern region of Ethiopia. I’ve decided to broach a touchy subject tonight that I’ve sat on for a while. When I write a blog, I often have a concept down, but there’s some part of it missing. That’s what happened with this post, until today. As I prepare to go back to Africa, a lot of things go through my head. How do I prepare, physically, financially, and especially spiritually? This is also a continual thought as people approach me who want to be involved on the going side of missions. I am always looking for people who will be involved not only with serving locally, but people willing and suitable to go and do the difficult work of traveling to remote places in Africa or Asia, with all of the discomfort and unknown factors that come with that. Well, there are far more devil worshippers in the church than is readily apparent, and I’m going to explain. A friend of mine said once, “Complaining is the devil’s worship music.” Let that sink in, because it’s completely true. There are people in the church that you can tell when they’re complaining because their mouth is open. A person with a complaining spirit sows all kind of discord around them and invites evil into their own lives. They cause division within a ministry group and make being a witness extremely difficult. They split churches and cause effective outreaches to cease. There is a direct tie between true worship and effective ministry. There is also a direct tie between gratefulness, thankfulness, and an effective witness. In many instances in the bible, miracles and great acts of God are immediately preceded by worship, especially in times where that worship was under difficult circumstances and trials. I think of Paul and Silas in prison, in chains and having been beaten. They began to worship, the earthquake came, and their chains fell off. As a result, the jailer and his whole family were saved. Now contrast that with a complaining spirit, that continually says, “I have been wronged. No one defers to me. Someone owes me. I demand my pound of flesh.” All focus in this case is on me, not God. There is no gratitude, and no seeking anyone’s will but my own. Everything that has ever gone wrong was always someone else’s fault. Despite the fact that many complainers constantly engage in self-effacement, they are not humble, because humility is not about thinking less of yourself. Rather it’s about thinking of yourself less. You can’t do that when you’re complaining. I would go so far as to say, no one was ever saved from their old life because someone was complaining. When ever I will be heading to the mission field, I go through a time of self-assessment. These are not just thoughts for “them”, whoever “them” is. These thoughts are especially for me. So to succinctly sum up what I’m talking about today, I’m finishing with the words from Philippians 2, which says the following. Therefore, my dear friends, as you have always obeyed—not only in my presence, but now much more in my absence—continue to work out your salvation with fear and trembling, for it is God who works in you to will and to act in order to fulfill his good purpose. Do everything without grumbling or arguing, so that you may become blameless and pure, “children of God without fault in a warped and crooked generation.” Then you will shine among them like stars in the sky as you hold firmly to the word of life. And then I will be able to boast on the day of Christ that I did not run or labor in vain. But even if I am being poured out like a drink offering on the sacrifice and service coming from your faith, I am glad and rejoice with all of you. So you too should be glad and rejoice with me. The good thing about having been involved with so many people and missions is that I’ve been able to see what works and what doesn’t. Which is what brought me to Luke 10 this week. It’s the chapter of the Bible where Jesus sends out 72 disciples in pairs as a kind of advanced party to everywhere he will shortly be going. It’s the only chapter where they’re mentioned, and until this past week I had never really though about who or what they were. So who were these 72 he sent out? I think we need to back up a chapter to Luke 9 where Jesus sends out his 12 disciples, his inner circle to do the following. There are two things I can take from this. The first is that missions will never be successful unless we are investing in people and raising up disciples. The second, and I think where missionaries and church leadership often makes the biggest mistake, is that Jesus didn’t try to do it all himself. He raised up leaders. He allowed people to fail, and in doing so he raised up more competent, passionate leaders. And if Jesus didn’t try to do it all himself, what makes us think we can? It’s something to think about. Repairing The Old Ripped Nets. I’d like to start this post a little differently than usual. I’d like to start by just listing some recent observations I’ve made. They may seem disjointed at first, but hopefully I can bring them all together. Yesterday I was in the gym. As I looked around the room, everyone in my line of sight was staring at their phones. A friend of mine from my childhood was furious yesterday because Donald Trump bragged about the great economy but was silent when the market did badly. He proceeded to verbally abuse someone about it on Facebook. The very first thing that God tells Adam in the garden is to subdue the earth. Subduing the earth is a really big job, a job for men of action. All throughout history, God has been looking for men of action. “Follow me and I will make you fishers of men.” “Be not only hearers of the word, but doers.” “I can do all things through Christ who strengthens me.” There are so many examples that I could not list them all. But at some point, we decided to discontinue being men of action and go with the lie. Which lie was that? That security and living life vicariously through the doers was preferable to taking a risk and being the doer firsthand. What are people looking at on their phones? They’re seeing what kind of exciting lives people on Instagram are living. They’re seeing what celebrities are doing. They’re checking the sports scores. They’re watching people who are doing or are making the appearance of doing what they wish they were doing. To the man who watched football and declared, “We did it!” I’m sorry, but you didn’t do anything. You weren’t on the field. To the man who was so upset about the president bragging about something; why on earth should that bother you? If you’re looking to control something, start with self and don’t abuse other people because you’re upset about what someone you’ve never met is doing. People are frustrated and fearful because they’ve given up significance. There is no significance in staring at your phone, or any social media. There is no significance in living life as if we’re somehow immortal in our current body if we can just avoid risk. We are supposed to be influencers and subduers. But if we don’t subdue the earth, the earth will subdue us. That’s just the way it works. The decision not to make a decision is still a decision. We are more than conquerors through Christ, unless we just give up. And that is what I fear we have done and just given up. Jesus told Peter and James, and by transitive property, us, “Follow me, and I will make you fishers of men.” At some point, we left the nets on the beach. They became weathered and dry rotted and ripped. It’s time to go back and pull those nets back out of the mud. It’s time to repair them, and fix the holes, and start catching men again. Don’t be fooled. You are an influence. It’s just a question of what type of influence you decide to be. I’d like to finish with a parable out of Matthew. Matthew 5:13 “You are the salt of the earth; but if the salt loses its flavor, how shall it be seasoned? It is then good for nothing but to be thrown out and trampled underfoot by men. You are the light of the world. A city that is set on a hill cannot be hidden. Nor do they light a lamp and put it under a basket, but on a lampstand, and it gives light to all who are in the house. As is my tradition, before I take a trip overseas, I write a test blog from my iPad. The interface is a bit different on a mobile device than on a computer, so I like to write at least one blog from the iPad to work out any kinks while I have access to power and bandwidth. Saturday I leave for Ethiopia. This is also the time when a hurricane is predicted to be passing through, but we will pray against that. If Jesus commanded the wind and the waves, and we are acting in his authority, then so can we. We are traveling to Ethiopia to do the finishing work on the Tesfa Center, which is a center designed to give destitute widows in the rural countryside a place to work and sustainably support both themselves and their children. James 1:27 came to mind today. It says, “Pure and undefiled religion before God is this: to look after widows and orphans in their distress and to keep oneself unspotted by the world.” We have been given the awesome opportunity to do this. Notice that is not enough to be unspotted by the world? There are also things that must be done. Likewise we are not just called to be busy. Faith without works is dead, just as works without faith will not save us. By faith we show gratitude to the God that selflessly gave himself for us, that while we were yet sinners he died for us. We in turn should live as ransomed people. As God gave his life for us, we return it by giving ours back. So long as I have internet I plan to give updates while I’m gone. Finally, I leave you with a picture of one of the widows we are going to minister to. A tree growing in the desert. The context and the preceding verse is conveniently omitted. This was the situation when Jeremiah prophesied those words; Israel had been carried into exile in Babylon. Their kingdom was gone, and their freedom gone along with it. They were aliens in a land not their own, and subjects of a pagan king. They longed to go back home, and false prophets were telling people that they would go home soon. Jeremiah had something entirely different to say, and it was something that came straight from God. Israel was complaining and asking “Why has this happened to us? When will God deliver us?” This sounds a lot like us whenever we face adversity, or when our life doesn’t look the way we want it to. We quote the verse about God wanting to prosper us, and fail to realize that He didn’t place us here for ourselves; that it’s not about us. I especially like the last part. “Seek peace and prosperity of the city to which I have carried you into exile. Pray to the Lord for it, because if it prospers, you too will prosper.” They weren’t to pray for judgement out of spite for carrying them into exile. They were to be agents of positive change where God had put them, even thought they didn’t want to be there. 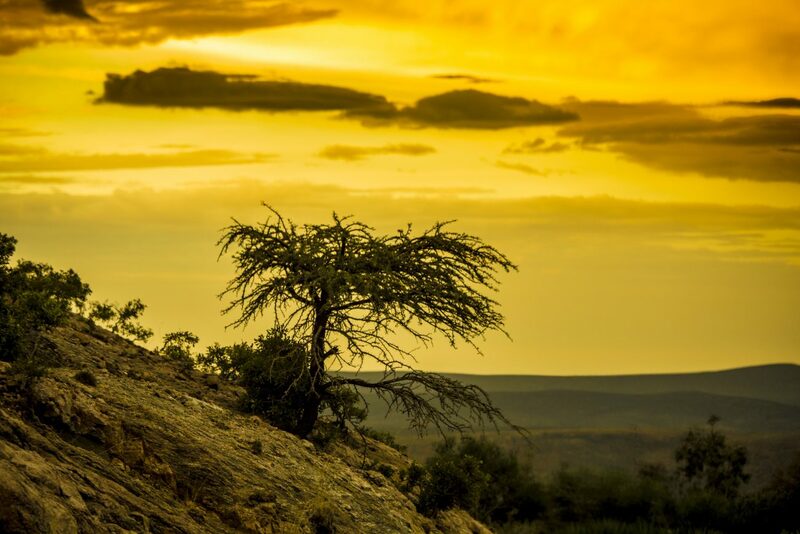 Have you ever seen a tree growing on bare rock in the desert? Often it will grow where a seed found a small crack, and will start putting down a tap root that eventually splits the rock. Here’s the thing about that tree. It doesn’t complain that it was planted in such a bad place. It doesn’t envy other trees that were planted closer to water, or in a better climate. It quietly takes in sunlight and whatever water God gives it, and uses those resources in the fullest possible way for where it lives. As it splits that rock, more soil gets trapped in the crack allowing other small plants to grow there. Sometimes it reaches water that was hidden or trapped beneath the rock, and it’s able to flourish and provides shade for animals and less heat tolerant plants. Eventually, over centuries, the entire landscape can change, and if enough plants grow, even the climate changes and the desert can disappear. If a tree growing on a rock can do this, how much more are we called to as beings created in the image of God? We were not placed here for us. We were placed here to make a difference in others, and consequently a difference in the world around us. Don’t moan about your situation and ask that God immediately remove you from the situation you’re in. Pray for the people and places around you, because if those around you prosper, so will you. Oh, Sorry. Don’t Use That Religion. It’s Just For Looks. I’ve been pondering this blog for about a week now, and I’m glad I pondered for a while and didn’t write, because an article came to my attention during that time that drove a lot of my point home. The article appeared on slate.com, and was titled, I kid you not, “In Medicine We Trust, Should We Worry That So Many of the Doctors Treating Ebola In Africa Are Missionaries?” I’m putting a link to it here, for those who care to read it, and it is an interesting read. My purpose in this blog is not to harp on the opinions of Atheists. I frankly have no right to do that, since I would be out of line in thinking that Atheists should act or think like anything except Atheists. Rather, my purpose in bringing up the article is to bring clarity to the way Atheists think, and why they think it. The author of the article, in his words, is a bit uncomfortable with the above situation, namely that it is almost exclusively Christian missionary doctors who are on the ground treating those with ebola. Which begs the question, “Why would anyone be uncomfortable with that?” The author gives a number of reasons, and I think he’s very thoughtful about it. But I think only an outsider looking in can cut to the heart of the reason why he’s uncomfortable. In order to be an Atheist, he has to, and has, convinced himself that there is no value in religion. The fact that these people, (as he puts it), who don’t profit personally from their work, and risk their lives to help others, proves that his previous premise is wrong, and therefore, causes dissonance in his worldview. 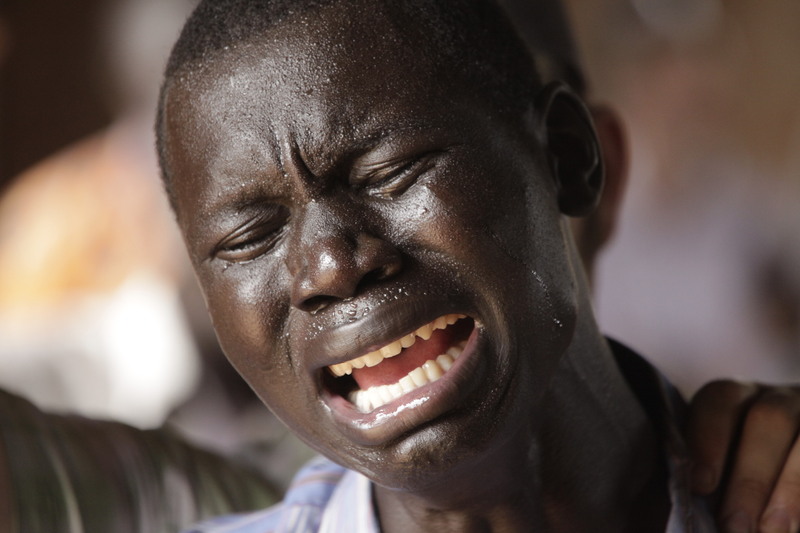 A pastor in South Sudan, broken in spirit as he prays that the man he professes to be would be the man others see. I’ve seen the same thing in my travels. The more dangerous the place, the more likely it is that it’s Christians who are there helping. By the time you get to South Sudan, whether the organization you are working with is officially Christian or secular, the people working there to help others are almost as a rule Christian. Now I’m not saying Atheists don’t like to help others, but the fact is that very few of them are willing to risk their lives to help others, being that what happens to them if they get killed is at the very least, uncertain. Again, though. This is not about Atheists. This blog is about Christians, specifically Christians who’s actions are so like Christ that they would cause an Atheist to question his worldview. Let’s flash over to the west, America specifically and myself included, where it literally costs us nothing to be a Christian. The attitudes I’ve seen in this country, even from those professing to be Christians is sometimes truly staggering. Attitudes like, “They have no business going over there. If they get ebola, they’re getting what they deserve.” I’m not joking. I honestly can’t understand the thought process, except to say that for every person willing to do something, there’s another person who’s willing to do nothing except pee on the first person’s shoe. Let’s see what Jesus had to say about this in Matthew 25. “For I was hungry and you gave me something to eat, I was thirsty and you gave me something to drink, I was a stranger and you invited me in, 36 I needed clothes and you clothed me, I was sick and you looked after me, I was in prison and you came to visit me. And you people had no business doing that, and if you got ebola, you got what you deserved.” Of course that’s not how the ending goes, any more than the following. “Then He will say on His left, For I was hungry and you gave me nothing to eat, I was thirsty and you gave me nothing to drink, 43 I was a stranger and you did not invite me in, I needed clothes and you did not clothe me, I was sick and in prison and you did not look after me. In fact, you didn’t do anything I asked of you. You took my free gift of salvation, then looked out for number one, and number one wasn’t Me. Great is your reward in Heaven.” If I heard that, I would have to assume I was being mocked. But that is how we often act, if not so explicitly. We go to churches that require nothing of us, and so that is what we give. We chase after consumerism and self, addictions, pleasure, and convince ourselves that we’re not bad people. And no, maybe we’re not bad people, but maybe also we don’t look enough like Christ to make an Atheist question his worldview. I hear people say that their faith is a private thing. If we follow Christ and our life looks like His, then how can it possibly be a private thing? Now we can say we’re saved not by works but by faith all day, but the fact is that if that salvation means anything at all, there should be some resemblance between us and Christ. Maybe if we stopped thinking about ourselves and all our stuff, we wouldn’t live in such fear as a society. You can’t fear losing what you’ve already given up, and that goes double for your life. The book of James says, “True religion that God our Father accepts is this, to look after widows and orphans in their distress, and to keep yourself from being polluted by the world.” Is this our religion, or is our religion a bowl of waxed fruit, or a couch you can’t sit on? Is our religion just a pretty (so we tell ourselves) thing, but others know that it’s a useless thing that collects dust, and everyone knows that it’s fake? Now before you say that I’m saying everybody should go and be a missionary to ebola patients in Liberia, I’m not. Not everyone is called to do that, but everyone is called to do something. Our mission field may not be Liberia or South Sudan or Afghanistan. It might be the single mom down the street or the prisoner in the local jail. When God called Moses, he made all kinds of excuses for why he couldn’t do anything. “I stutter. I’m just a shepherd.” Etc. etc. etc. God said to Moses, “What do you have in your hand?” “A staff”, Moses replied. God told him to throw it on the ground and it became a snake. God told him to pick it up again and it again became a staff. I would challenge each person to ask themselves, “What is in your hand?” What skills and talents do you have? Even if we’re just holding a stick, God can use it if we’re willing. What gifts has God given us that we aren’t using? Why aren’t we using it? It’s time to put the excuses away and start living the life that Christ called us to. He has called us to a triumphant life in Him, and not a life of fear. I pray that He will forgive me for failing in this, and I know He will. But I on the other hand will pledge to daily give Him less reason to have to forgive me.